After our most peaceful night yet, we begin to remember the joys of being at anchor, of finding places of tranquility and solitude, to truly escape. We prepare to leave at a leisurely pace and find the biggest Barracuda we have ever seen under the boat. Bertie must have been at least 6 foot with dark striking colorations and a persistent nature. Even as we struck up the engines he tried to remain with us under the hulls but alas poor Bertie got left behind as we picked up speed heading for Allen’s Cay. 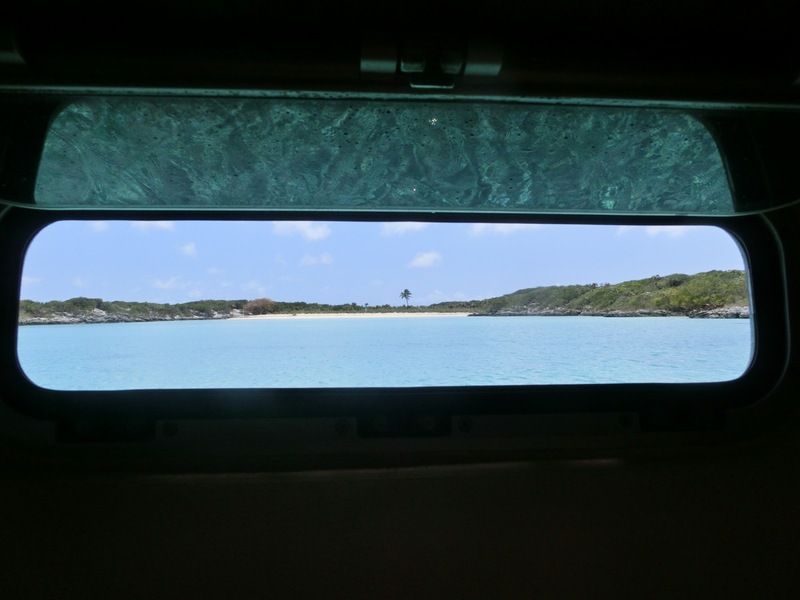 Our target anchorage was hopefully to be the bay in Little Allen’s Cay and we’re both surprised and delighted to find no boats there at all. We had the whole stunning bay all to ourselves. We soon realised that by the time we’d anchored getting as far in as we could, there was little room for any other boat. 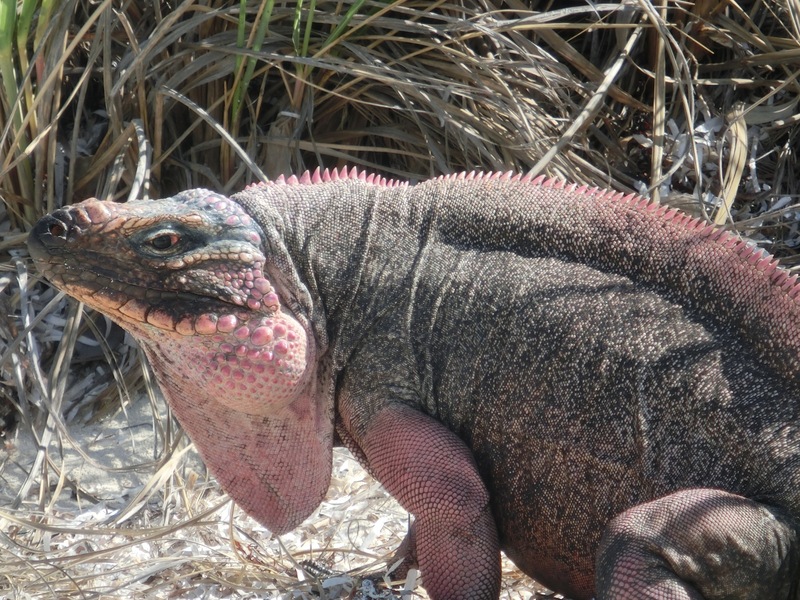 We had read that the more popular Leaf Cay was visited several times each day by high speed motorboats arriving with contingents of broccoli brandishing guests from Nassau eager to feed the voracious appetites of the iguanas found there. We can now bear witness to this, finding that these boats pay no heed to those snoozing peacefully on the tramps at anchor but rather more sped through the channels creating enough wake to give us another half meter under the keels! 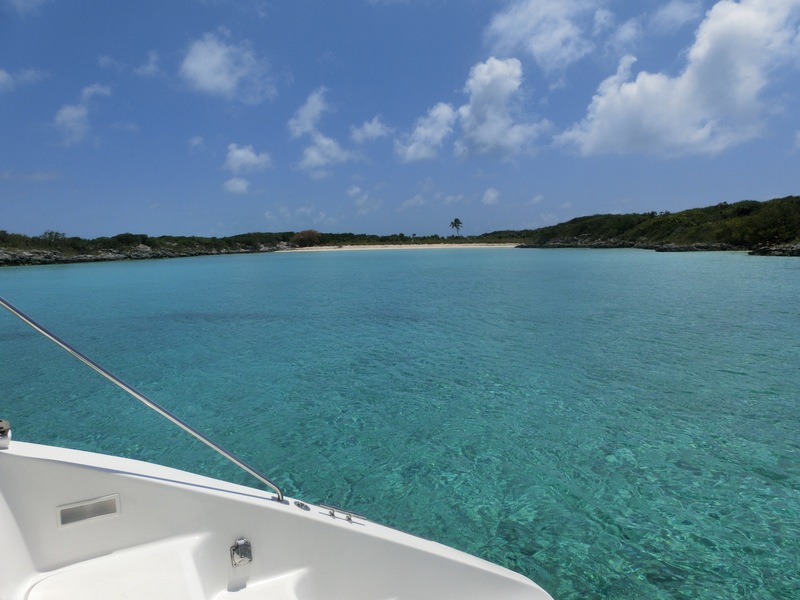 We got ready to dive on the anchor for reassurance and found it not so reassuring that with our rusty seamanship we’d set off from Ships Cay with our swim ladder and swim rope hanging down in the water where it remained after yesterdays first swim. Needless to say we were glad to find that the rope cutters had dealt with it most effectively but note that Slurpy is now sporting a much shorter painter! . 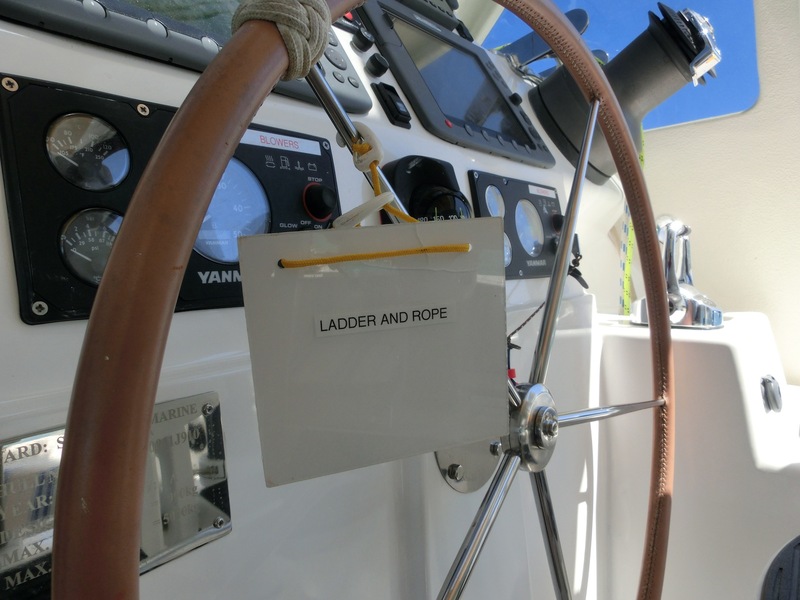 We now display a somewhat untimely notice on the helm saying “Rope and swim ladder” where it will remain until we get back into routine! We dove and found that our good old Rocna had dug his heels in holding fast in the fine white sand. We were not alone for long, being joined by a very inquisitive stingray that took a great interest in Lesley. Great amusement to Paul watching as it followed her every turn but not so amused when it switched attention back to him. Its ok to observe such sea creatures whilst you remain in control but when the roles are reversed it becomes a little disconcerting. We’re sure that it was just as curious of us as we were of him. It was such a shame that we didn’t have the underwater video camera to make the most of this fishy attraction. 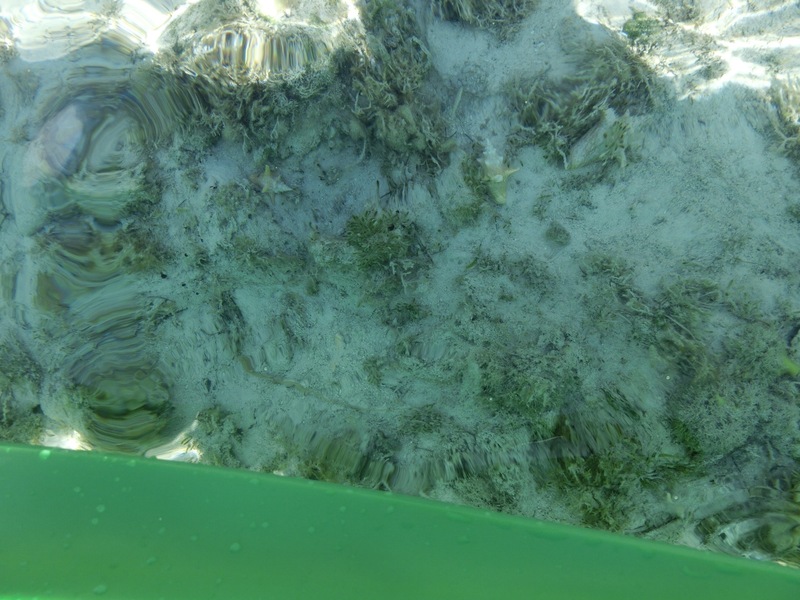 So we headed off for s snorkel around the bay, with the water being gin clear it was a lovely place to get used to being in the water and amongst such a wonderful variety of sea life around the rocky perimeter. Swimming through the middle of the bay and closer to the shore found it to be a grassy nursery haven for baby conch, they were simply everywhere delightfully perfect little miniatures romping about in the grassy undergrowth. This was the perfect bay to try out our new kayaks we’d been itching to launch them but had not had any great opportunity to date. And so it was that we unceremoniously plopped them overboard trying to think of names but failed at this time Lesley saying that we had not yet ascertained their personality types! 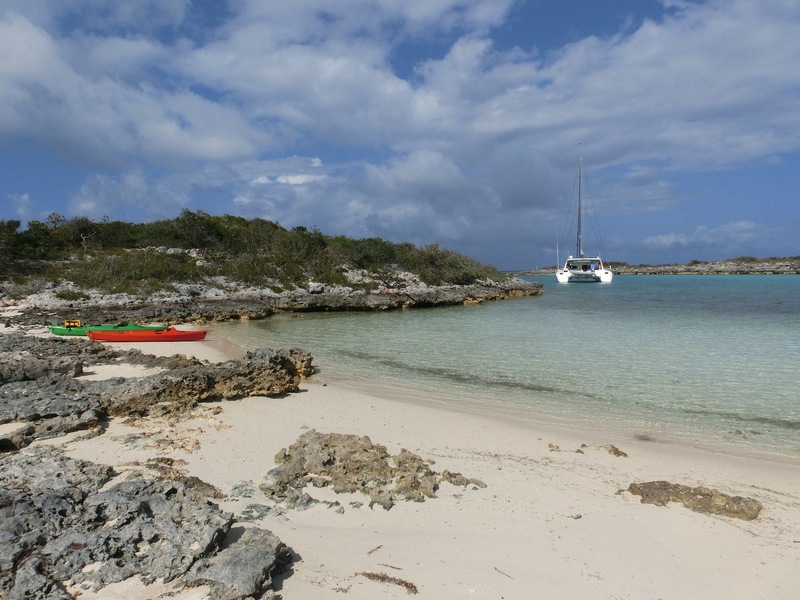 Kayaks proved to be the ideal transport to quietly arrive at the beach without scaring the iguanas. Lesley had spotted them through binoculars from Suliere and we’d heard their strange whooping calls so we knew they were around even though we couldn’t see any on approach. Lo and behold as soon as we got close to the beach there was a loud rustle in the undergrowth as several iguanas came lumbering forward to greet us. 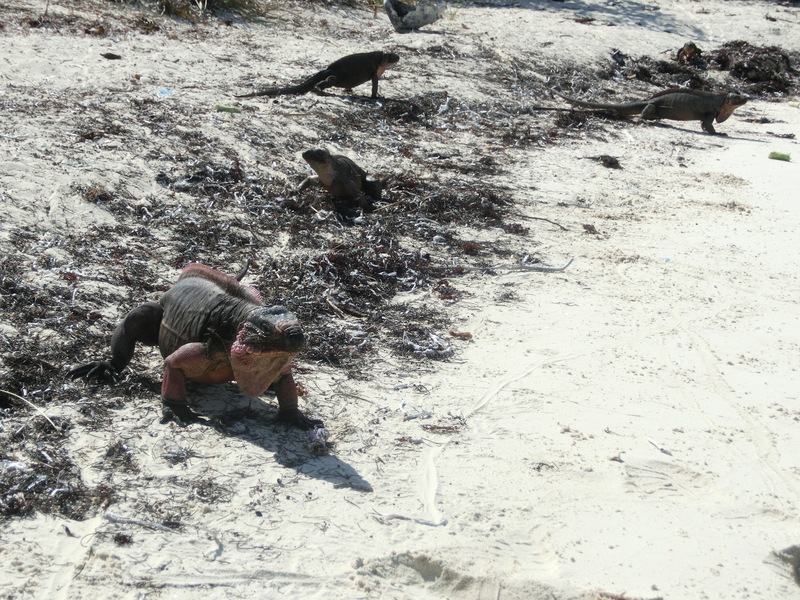 We’d read in all the guidebooks that to help maintain the health of the iguanas we should refrain from feeding them so we arrived empty handed but they clearly had expectations. Paul got happy with his video camera and filmed their greeting and Lesley started snapping away with her camera finding such fascinating subjects irresistible. 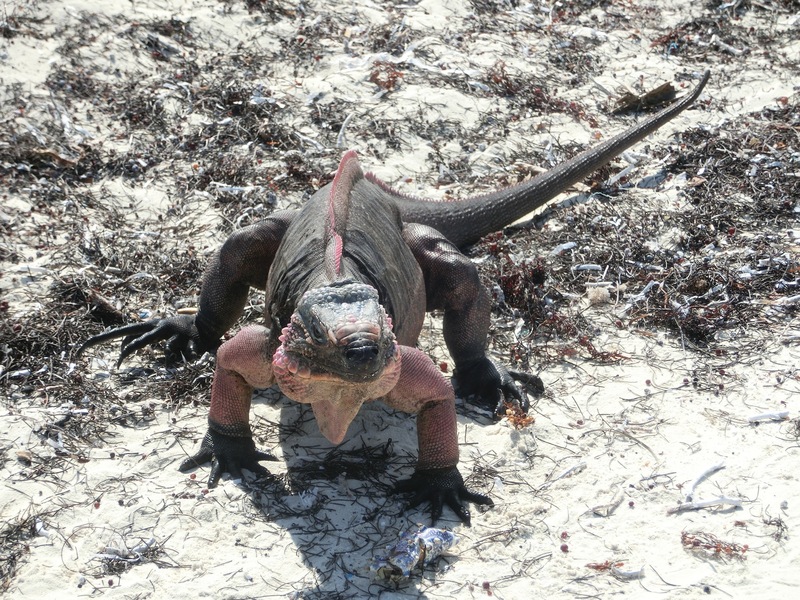 The iguanas here are a little less used to visitors than the ones on Leaf Cay and so less aggressive. In fact we found them to be somewhat shy having to balance their natural shyness with their hope for food….. all very interesting and a great start to our cruising proper. We’d anchored in about 1.5 meters of water but with about a 20 cms of neap tide above that. As we draw 1.5 meters this left us just 20 cms clear at low tide. Paul was able to dive on this low point and observe the clearance. It was a good confirmation of the actual draft of Suliere and validity of the depth meter settings. Much to Lesley’s relief! We set up the anchor alarm on the newly acquired iPad and left less than ten foot of drift allowed back towards the rocks before it would alarm us. We declared all the area in front of the bow an unsafe zone so that we would be warned of any change in direction of wind. It never left the safe zone all night. The haunting calls of the iguanas echoed across the bay at night fall, a lonely call in the darkness of the night maintaining ones curiosity into the lives of these prehistoric looking creatures.